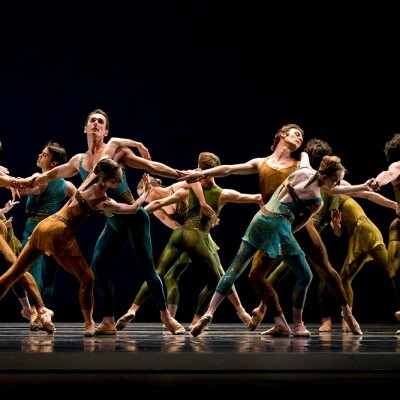 The San Francisco Ballet (SF Ballet), formed in 1933 to train the dancers who appeared in San Francisco Opera productions, is the oldest professional ballet company in America. By 1938, SF Ballet’s then Artistic Director William Christensen also was creating full-length independent productions, including the first fully staged U.S. presentation of Swan Lake in 1940 and the first complete Nutcracker in the U.S. in 1944. SF Ballet was the first American ballet company to tour to East Asia, in 1956. Continuing its pioneering tradition, the company performed in the first full-length ballet ever produced for the PBS series, Dance in America, in 1976. Since 1942, SF Ballet has operated separately from the San Francisco Opera, launching its now-prominent school in the same year. The SF Ballet School provides rigorous pre-professional training for hundreds of young students and aspiring dancers each year. More than half of the Ballet’s company of professional dancers received their training at the SF Ballet School. Other former students have gone on to dance with professional companies nationally and around the world. 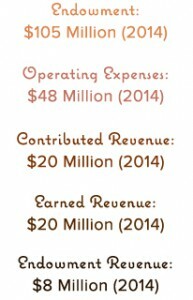 As the country emerged from the Great Recession in 2009, Ballet leaders identified five breakthrough objectives “to achieve artistic flexibility through financial strength.” One calls for a gradual increase in total performances, another for an increase of at least 10 percent in paid attendance. The Ballet identified digital media as a tool to advance these objectives. In 2011, the James Irvine Foundation awarded the company a $900,000 three-year Arts Innovation Fund grant to expand its social media and other digital engagement programs. Through social and digital media, SF Ballet planned to identify and involve more people, globally and locally, and to grow both audiences and awareness. The project launched with a research study conducted by WolfBrown that gathered new information about audience habits and preferences. Not surprisingly, research identified an individual’s knowledge level of ballet as the key indicator of frequency of attendance and allegiance. A significant number of audience members also reported that they access dance regularly via media: films, television programs, YouTube, and other channels. Further, the majority of ticket buyers said SF Ballet is their sole source of engagement with dance. These insights helped SF Ballet understand that a contemporary concept of “the audience” should include all people who have a relationship with the organization, not only ticket buyers, but also digital audiences. The direct correlation between knowledge of ballet and audience members’ levels of participation also stimulated the Ballet to pursue new initiatives designed to increase the audience’s understanding of the art form. 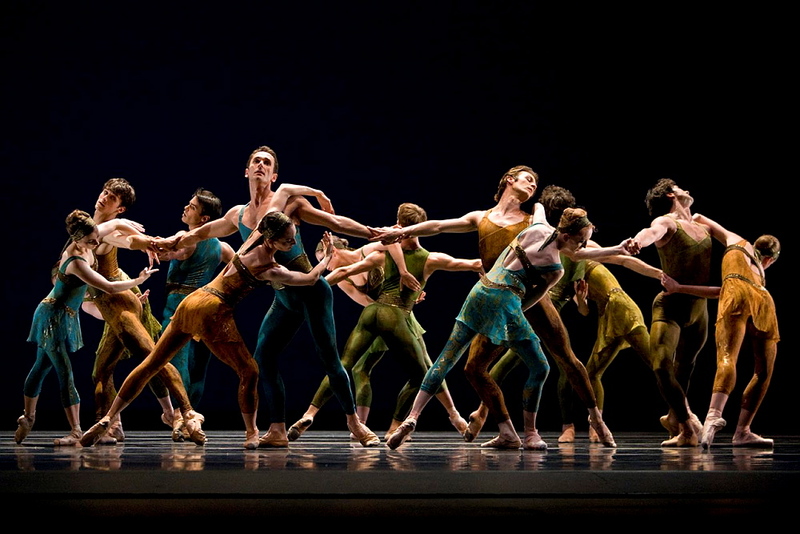 SF Ballet took this information and built digital programming in response. The overarching digital strategies are twofold: to help audiences learn more about ballet and to engage people with the company’s work and its artists. A website re-design is providing a refreshed platform for audience exploration and connections, not just ticket sales. Content expansions will eventually include a searchable database of repertoire and artists, as well as new educational content including expanded video offerings. SF Ballet also is continuing to direct its attention to building audiences on social media channels. The company has developed a large Facebook following (more than 278,000 people) and also creates inventive content on Pinterest, Twitter, and Instagram. The company’s “posts” include distinctive photos from rehearsals and performances; live Twitter chats with dancers; information about work-in-progress and behind-the-scenes insights into tours, productions, and plans; and personal stories from the artists involved in bringing dance to the stage. 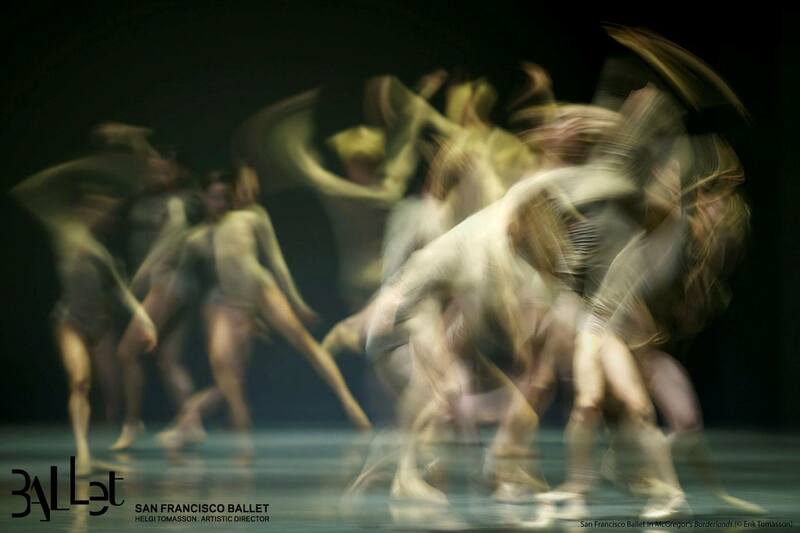 SF Ballet’s social media channels invite participation. For example when dancers toured to Paris in summer 2014, audiences were invited to “pin” pictures of favorite Parisian haunts on Pinterest, and offer reasons to visit them. The result is a chatty and engaging set of channels. SF Ballet has discovered that about half of its Facebook fans are themselves dancers, helping steer digital content toward this group of people. SF Ballet and several other performing arts organizations recently collaborated to develop a new Facebook app that allows audiences to purchase tickets without leaving the Facebook environment, then invite their friends to a performance and see where they are sitting. Tessitura, the software platform used for ticketing by many performing arts organizations, is collaborating on app development and is now licensing the app to other Tessitura users. 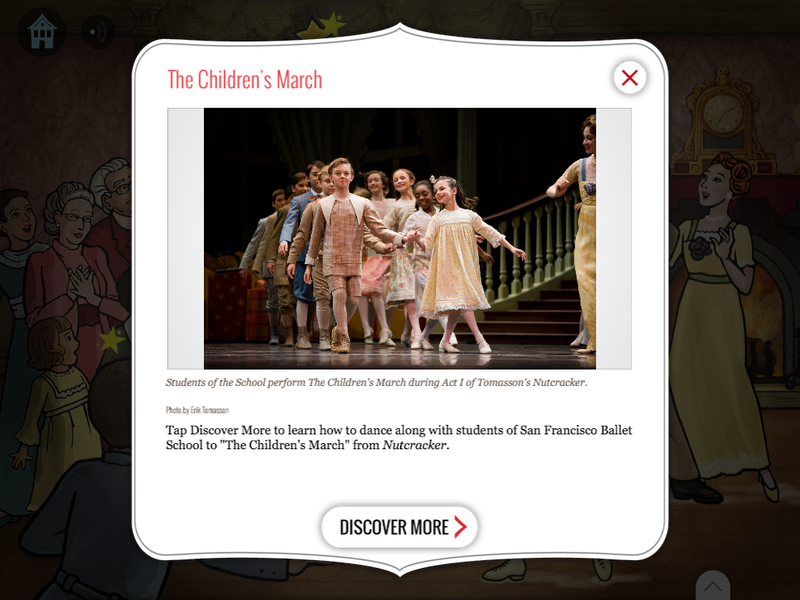 SF Ballet marketing and education staff also collaborated on a major project, releasing a 2013 tablet app called the Nutcracker Interactive Storybook. 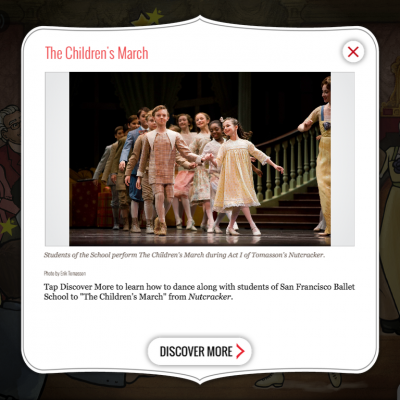 Designed for young children and their families, the Nutcracker app uses animations, video, and other features to enhance the SF Ballet’s production of the holiday classic. 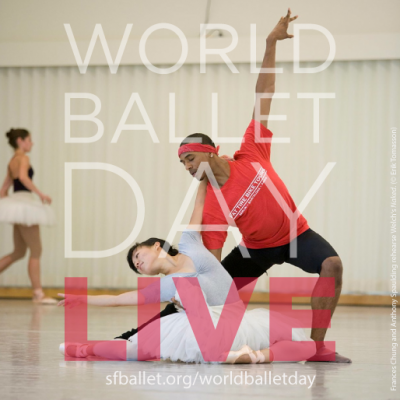 In 2014 SF Ballet launched its first Kickstarter campaign to crowd-fund its participation in World Ballet Day Live. This was SF Ballet’s first foray into online fundraising, and the company quickly raised and exceeded the $30,000 it sought from digital audiences. World Ballet Day Live was itself a digital project, spearheaded by the Royal Ballet (London) and involving five global ballet companies in a 20-hour continuous stream of ballet performances, rehearsals, and backstage tours. With seven collective bargaining units involving dancers, musicians, and stagehands, SF Ballet also is working to streamline its bargaining agreements to allow more and faster sharing of digital content. Overlapping and divergent work rules make it challenging to share more than short clips of much longer full performances. Each new digital initiative requires careful collaboration with artists around work rules and permissions. Many times unions have helped clear projects, but the approval process can be laborious. What’s needed are new and comprehensive agreements that allow performance content to be produced quickly and nimbly. SF Ballet leaders say the organization’s growing digital reach presents both challenges and opportunities. Foremost of the challenges: the additional resources, cross-organizational communication and collaboration needed to plan, produce, and distribute digital programming. The most tantalizing opportunity: the prospect of reaching and engaging thousands of new followers through digital initiatives. Over the past four years, the company has reduced its marketing costs form 29 cents per dollar of ticket revenue to 21 cents – due, in part, to the company’s focus on digital strategies. And more good news: tickets sales are up.